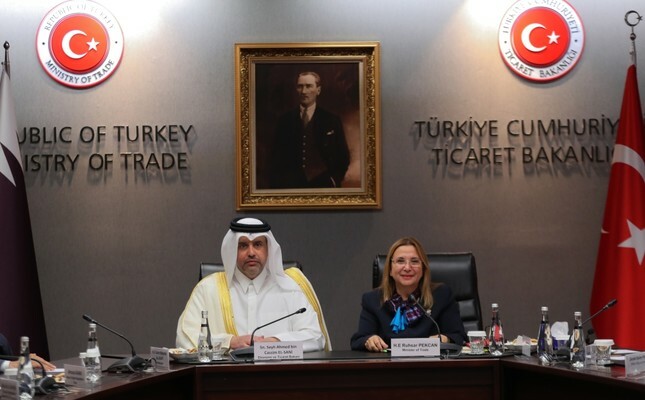 Trade Minister Ruhsar Pekcan and her Qatari counterpart Ahmed bin Jassim bin Mohammed Al-Thani signed the Economic and Trade Partnership Agreement in Ankara, Sept. 4. Trade Minister Ruhsar Pekcan and Qatar's Economy and Trade Minister Ahmed bin Jassim bin Mohammed Al-Thani inked the Economic and Trade Partnership Agreement yesterday in Ankara. Speaking following the meeting between the delegations, Pekcan said a new stage in Turkish-Qatari friendship had been reached. "We are signing a special agreement regarding the consolidation of friendship and economic relations between the two countries. We hope that the agreement will be beneficial to the trade of both countries," she said. The deal targets the comprehensive liberalization of goods and services trading between the two countries. The agreement, which also includes telecommunication and financial services, will provide a serious breakthrough in reducing Turkey's current account deficit and attracting Qatari capital to the country. It is expected to reduce the costs in production through the cheaper supply of refined oil products and natural gas. Turkish exports to the country reached $611 million in the first seven months of this year, while the imports from this country stood at $195 million, according to data by the ministry. Turkish contractors have undertaken 137 projects in Qatar to date, totaling $14.8 billion. Meanwhile, Qatar's Emir Sheikh Tamim bin Hamad Al Thani visited Ankara last month in an apparent show of support for Turkey, pledging $15 billion in direct investments in the country that finds itself embroiled in a crisis with the U.S. The Qatari emir met with President Recep Tayyip Erdoğan with whom he discussed the U.S. sanctions against Turkey, bilateral relations as well as other regional developments. They were accompanied by Treasury and Finance Minister Berat Albayrak and his Qatari counterpart Ali Sharif Al-Emadi. Following the investment decision, Qatar's private sector has also turned to Turkey, with five major conglomerates looking to invest $300 million in the first phase. Ahmet Hasan, the general manager of Royal Link, which manages the investments of Qatar Holding, Essa, Nora Raşit Al Doosori, Al Sumeiti and Raşit El Kubeysi, had said over the weekend that people of Qatar are "quite willing" to invest in Turkey. "The sheikhs and bosses, who are the owners of the five major companies that we consult, are willing to invest in Turkey in every field, from energy to agriculture and real estate," he had said. "We do research all over the country. We initiated our first acquisition with a wallpaper factory in Adana. In addition, a huge tract of land was purchased for the production of dried fruit. Now, we are in talks to get a site of villas." Furthermore, TTR Investment Chairman Fatih Tataroğlu also said Turkey's support for Qatar won great sympathy in the region, peaking with the struggle against the U.S.
Tataroğlu added that the Qatari companies are seeking Turkish partners under the directive of Al Thani. "Qatar has launched an industrialization campaign. Investors are in talks with the potential partners in Turkey. Soon major partnerships will emerge with great investments to provide employment for thousands of people," he said. Azure Group Chairman Erkan Gül said yesterday they are partnering with one of Qatar's five largest families. "We have built a special trade bridge with the Al Khayarin Group, which has investments in several sectors from retail to automobile, to bring new investments to Turkey. Especially in this period, this trade bridge between Qatar and Turkey will do its part and take new investments in its agenda," Gül said. Gül stated that the perception operation carried out over the foreign exchange will not affect the relations between the two countries in any way. Gül, the chairman of Azure Group, which undertook very intensive commercial cooperation between Turkey and Qatar with $5 billion in Qatari capital, announced that commercial relations will continue non-stop, adding Qatar's investments in the country will further increase in the future. Qatar and Turkey's central banks inked a currency swap agreement days after the meeting between the leaders of the two countries to provide liquidity and support for financial stability. The agreement, which was signed by the heads of the two central banks, will establish a two-way currency exchange line, read the statement by the two banks. The deal will facilitate trade between the two allies as the Turkish currency is battered by a deepening spat with Washington, the Central Bank of the Republic of Turkey (CBRT) said. The swap agreement was signed over the Turkish lira and Qatari riyal and concluded with an overall limit of $3 billion, according to the CBRT, who had said the core objective of the agreement is to facilitate bilateral trade in respective local currencies and support the financial stability of the two countries.